We LOVE Missionaries and we LOVE sending Care Packages! 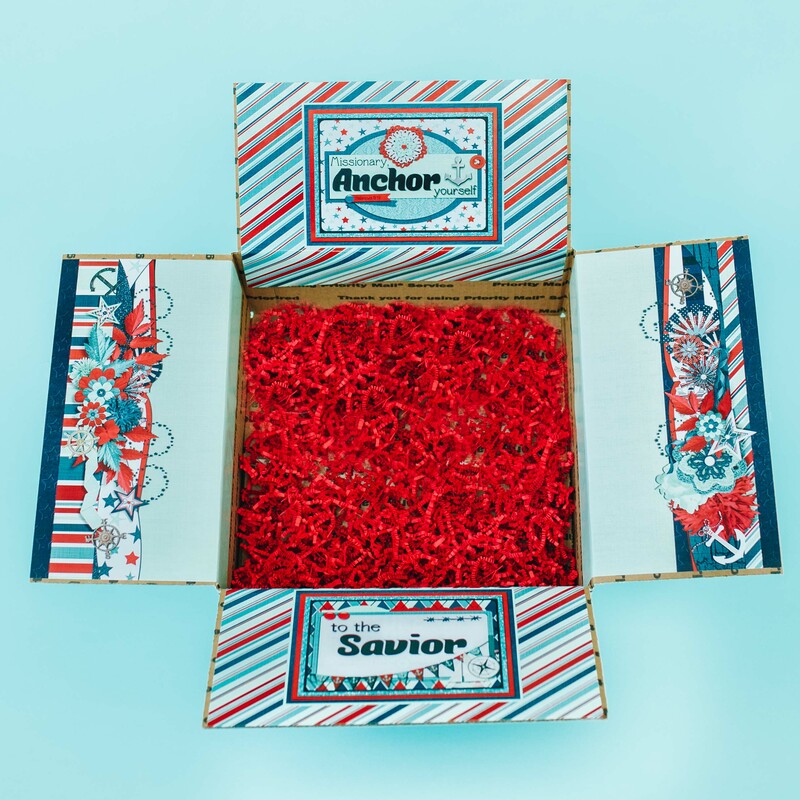 It’s always fun to send our Kiddos a care package – but it’s super fun to send a Red, White, and Blue ‘Anchor Yourself to the Savior’ box. ✔ 1-Introduction Letter with easy to follow instructions to help you put together the Perfect Care Package. ✔ 1-Box Introduction Letter to be placed in your Box right before you tape it up. This unique design lets your Missionary know the theme of your care package and that something special has been created just for them! ✔ 1-Page of Unique Envelope Designs that you can adhere to the front of your Letter to your Missionary and their Companion! This page is also printed on sticker paper – so you just need to cut them out and adhere to any envelope of your choice. It’s that easy! ✔ 1-Custom Missionary Letter for you to include with your personal Letter to your Missionary. ✔ 12-Pages with over 22 Custom Tags and ideas that can be used throughout your box as desired. This box could be sent at any time of year but I just happened to send it right before the 4th of July Holiday so I was able to find tons of things in the nautical colors of Red, White, and Blue. Plus it was fun to throw in a few Fourth of July treats and decorations. You could also shop the ‘after’ 4th of July sales when everything goes on clearance. Strong and Steadfast!!! It’s always so fun to see the pictures our missionaries email home of them opening up their crazy boxes decorated in whatever the theme of the box is. Wherefore, whoso believeth in God might with surety hope for a better world, yea, even a place at the right hand of God, which hope cometh of faith , maketh an anchor to the souls of men, which would make them sure and steadfast, always abounding in good works, being led to glorify God. By small things great things can be accomplished. An anchor is a small thing – but look what it can do for a ship. I am Master of my Fate & Captain of My Soul. A Smooth Sea never made for a skillful sailor. Thought: A Kite is a similar example to an anchor. As long as the kite is anchored to the string it will fly higher and higher but the very minute that the string is cut the kite falls from the sky. of the lights along the shore. Send a gleam across the wave. you may rescue, you may save. loud the angry billows roar. for the lights along the shore. in the darkness may be lost. Think about being a “lower light.” There are many references to lower lights and lighthouses, but there are typically two lights on a lighthouse, referred to as the upper and lower lights. Both are needed for ships to safely reach the harbor. Christ is the Upper Light. He is always there, and His path is always clear. We are the lower lights – we must have our lights shining so that others can find their way back to our Savior. Without our lower lights being on, souls around us can be lost. Start now in setting new goals for yourself to be a strong “lower light” and to be one that weary travelers can look to for help reaching the harbors during the storms of life. What can you do to strengthen your lower light? So many oceans to explore. As I leave behind the safety of the shore. 4. When I’m tossed upon the waters. When winds of change begin to blow. His words of truth I will follw. The Savior’s hope is the anchor of my soul. 2. When I’m tossed upon the waters. His words of truth I will follow. Trying to tear me from the fight. The journey starts to take its toll. That test my faith and stretch my soul. All alone I leave the harbor. These words are true and testify of the mercy of Jesus Christ. No matter how evil or awful the waves of the world are, we an be safe if we stay anchored to our testimonies of the Savior. I we follow His words and live by His teachings, we can even avoid many of the storms that others face due to the consequences of their choices. What are some things that you can do to stay anchored in Christ? Ahoy Mateys! Depending on the size of the box you are sending – you could include or delete any of the following items below – or come up with a few of your own. I tried to make sure that most of the items could be used to enhance missionary discussions, to be given away, to decorate their missionary apartments and left for future missionaries when they moved on, or simply eaten and enjoyed. But of course there were always a few that were just for fun! Nautical Anchor Men’s Dress Socks or Navy Blue Ladies Tights (Tie them up with fun Red, White, and Blue Ribbon. 8. Scrapbook paper from the ‘Nautical’ collection from the Fancy Pants Designs, Inc company. Or Make an Anchor Bracelet Yourself! Howard Lyon was born and raised in Mesa, Arizona. He is the youngest of five children. Howard had very supportive parents who, even when he was very young, made sure he had the materials and education to hone his talents. While attending high school, Howard met his wife, Shari Lunt. After they graduated, Howard served a mission and then they married and went to BYU and started their family. He began his career studying illustration at Brigham Young University working with artists such as Robert Barrett, Don Seegmiller, James Christensen, and Greg Olsen. Over the past twenty years he has worked in the video game industry as an art director, concept artist, and freelance illustrator. For much of his career he has painted dragons and trolls or scenes from science fiction. His work can be found in products from Dungeons and Dragons books, World of Warcraft cards, Magic: the Gathering and Star Wars. He has studied art in Italy, France, and most recently at the Grand Central Academy in New York. He has recently combined these experiences to switch gears and expand his subject matter to create inspirational pieces in the style of some of his favorite old masters: William Bouguereau, Lawrence Alma-Tadema, and John William Waterhouse. Will you share your thoughts about your painting From Fear to Faith? It was an important piece, very personal in some ways. The disciple on the left-hand side of the boat is bailing out water. He is focused on the storm in the distance. He sits in darkness and can’t see Christ. He is so busy working to save himself that he doesn’t notice the Savior or turn to him. His actions are dictated by fear. The next two disciples are gathering in the rigging and trying to right the mast. One pulls ropes in from the water and the other leans back, both still trusting in their own strength, not wanting to let go and approach Christ. The disciple behind the mast has just let go of the cross bar. He has done everything he can, and is now turning towards Christ. Faith is guiding his actions now. The next three disciples sit in the boat, turned towards Christ. They have the faith to do this but haven’t approached him yet. A little hesitant, but for the most part, their faith has pushed their fears away. The two that sit together, one with his arm around the other, represent the idea that sometimes we need put our arm around our brother, or know that it is okay to lean on another for a time. The last disciple, Peter, is at the front of the boat. He had the faith, in the middle of the trial, to kneel at Christ’s feet and ask to be saved. At that point, he heard and felt the great words, “Peace, be still.” In the middle of the trial, his faith was whole and knew that he could turn to Christ for salvation. Warner Sallman was born on April 30, 1892, in Chicago. He became interested in art at an early age, and was especially impacted by the religious art of Gustave Dore. Following graduation from high school, he apprenticed in local studios while attending the Chicago Art Institute. After a brief attempt to establish himself in New York, Sallman returned to Chicago and began his career as a commercial artist. In 1924, Sallman produced a sketch for a magazine cover that portrayed a strong yet serene image of Jesus. This sketch was the basis of what would become Sallman’s most recognizable painting, the Head of Christ, which has been reproduced an estimated 500 million times. Throughout his career, Sallman produced a wide range of religious imagery, including Christ at Heart’s Door, Christ Our Pilot, and Christ in Gethsemane. Plain Cotton T-Shirt – any color. (I bought mine at WalMart for $4 and I purchased an extra shirt for my son’s companion – so I did one Red shirt and one Blue shirt to stay with the Nautical Theme). It is super easy to make your own stencil. Simply print any Anchor design off of the Internet onto regular paper. Cut it out but not right next to the Anchor design yet because you are going to adhere/stick it to it to any inexpensive Magic Cover paper you find at your local Dollar store. (The kind that you use to cover the insides of a cupboard.) I used clear. I used glue dots to stick my stencil to the Magic Cover paper but you can use scotch tape or anything you have around the house. Then cut it out. The first thing you need to do is make sure your shirt is clean and wrinkle free. To protect the back of the shirt from bleach, slide a piece of cardboard inside the shirt. Make sure the cardboard is big enough to protect the entire shirt from any bleach overspray! Attach your stencil to the shirt and firmly press down all the edges. Then you’re ready to bleach! Pour about a quarter cup of pure bleach into a spray bottle. You don’t need to dilute the bleach for this project. Set the spray nozzle to spray a super fine mist. Trust me; the tiniest bit of bleach will do the job! If you’re worried about how heavy your spray will be, just practice spraying a piece of cardboard first. You want the bleach to just barely mist the surface of the cardboard, not soak it! Start by gently spraying a very light coat of bleach onto your shirt all around the stencil; one or two trigger pulls will do it, you don’t need a lot of bleach. Immediately blot the whole area with a paper towel. You don’t want any giant puddles of bleach on your shirt or on your stencil! Bleach works pretty quickly, but it can take up to two minutes for the bleach to pull all the color out. One or two sprays of bleach will eventually lighten the whole area; don’t get impatient and spray more bleach, just give it more time to start working. If it’s not bleached enough after a few minutes, do another gentle spray, blot it up, and wait again. Also, don’t freak out when the shirt changes colors during the bleaching process! About fifteen seconds in, the bleached areas of my shirt turned green and I thought I had ruined the whole thing! That is just the color starting to come out of the shirt. About ten seconds later it had turned orange like in the picture below. Don’t pick up the stencil until you’re sure your shirt is exactly how you want it! Then gently peel the stencil away, and you’re done! Hang the shirt and let it dry. If you were a little heavy handed with the bleach, you may see some fine dusty powder on the shirt once it’s dry; that is just crystallized bleach. The best way to get rid of crystallized bleach is to throw the shirt in the dryer for half an hour. The tumble dry will knock the bleach powder loose without bleaching your shirt any further. DO NOT GET YOUR SHIRT WET if you see this powder! Water will reactivate the bleach and your bleach shirt design will be ruined! Once the shirt is dry and there’s no crystallized bleach on it, rinse the entire shirt in cold water. Hang it up to dry, and then you can wash and dry the shirt as usual without fear of ruining the design. You may want to wash it by itself once; just to be sure you don’t accidentally bleach any other clothes.